Hey, everybody! I’m starting a new monthly thing on here called Fashion Wars. Every month, I’ll dress my dolls according to a certain category, and you girls will get to vote all month on which outfit you like best! This is really, really fun to do. 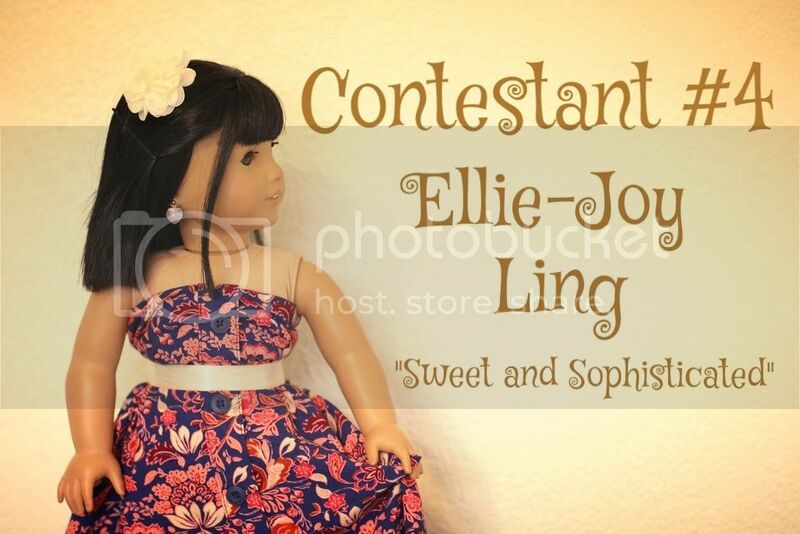 I love being able to be creative with each of my dolls and choose outfits for them based on their personalities. Oh, and I’m sorry this post took so long to be put up! I’ve been working on a lot of posts to post and I’m really excited about them. 😀 The reason I couldn’t post any of them yet was that I had a lot of technical problems with my photos. But they’re all fixed now and I can’t wait to post more often! This month’s category is Banquet/Ball Gowns! 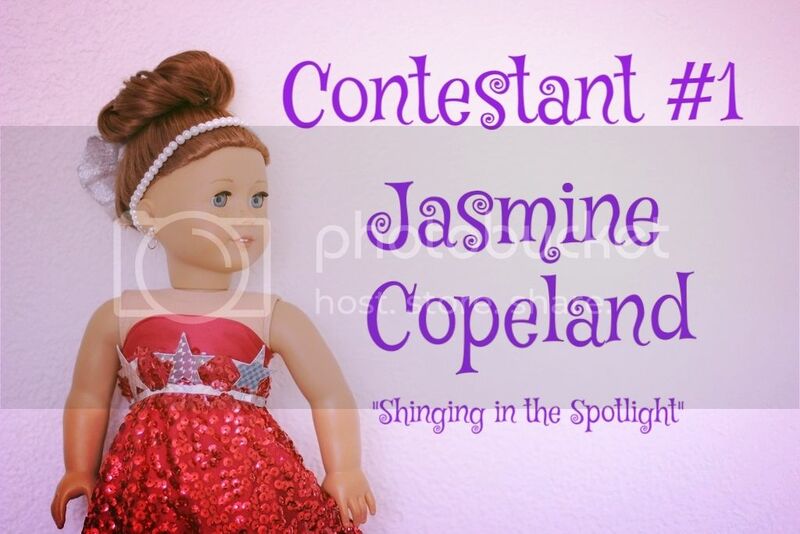 Our first contestant is Jasmine Copeland, with her outfit named “Shining in the Spotlight!” Here’s the front view of her very elaborate dress. Her hair is done in a twisted bun updo with a big silver bow in the back. Around her head is a headband of stringed pearls, with matching pearl earrings and silver dangles. Onto the dress itself! It’s made of a red material and completely covered in shiny red sequins. That wraps it up for contestant #1. The dress itself is of a beautiful, flowy, desert-y design. Her hair is done in a side braid (tied with a navy blue bow) with two small braids meeting together from the front. She’s wearing a pretty little cross necklace. It’s actually a human necklace I got for 25-50 cents out of a little machine at Wal-Mart a very long time ago. I’ve had it since I was really little! And that’s our second contestant! With our side and back views you can see this dress is incredibly long! Emelie’s hair is done in a young, simple fashion with a high ponytail. Two small strands of hair hang down in the front and she wears a white headband and hairband. Her sash is also white with a beautiful flower in the middle. Emelie likes both the simplicity and dramatic appearance of this dress. What do you think? You’ll have a chance to vote at the end of this post. 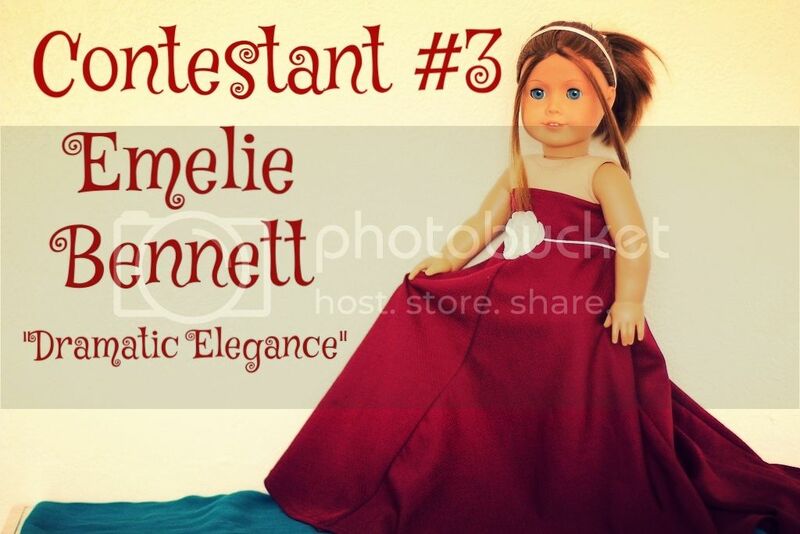 Actually, considering this post is pretty long, you can skip all the way to the end and see final photos of all the dolls in their dresses and vote if you’d prefer. Isn’t her hair so beautiful? This has to be one of my favorite hairstyles on Ellie. Two front sections of her hair are bobby-pinned back with two strands left hanging. I added a cream flower accesory in her hair to go with the cream accents in her dress. As you can see it brings together the cream accents. The dress itself has a flowery pattern with buttons down the front. 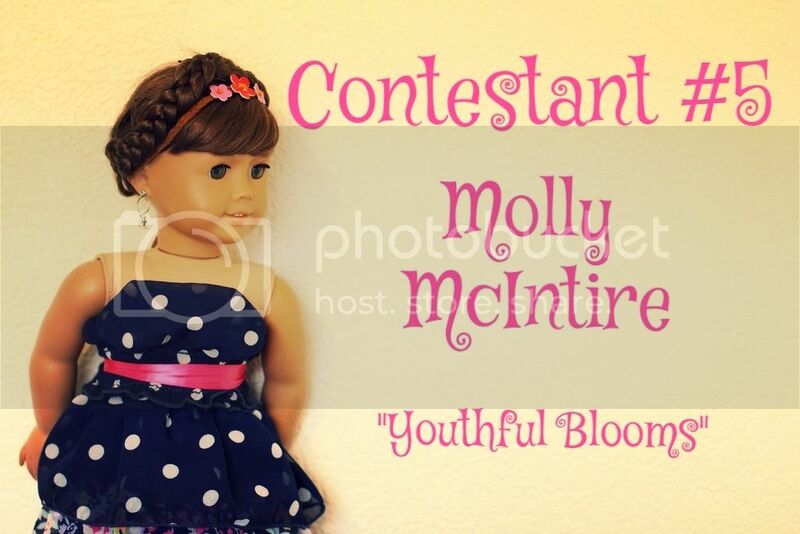 Now let’s head on to our fifth contestant! She bears a beautiful silver and pink tiara. The dress is also a three-layer tiered one. Aren’t her curls just so beautiful? Her hair is pulled back in a young, carefree, simple style with a pink headband. 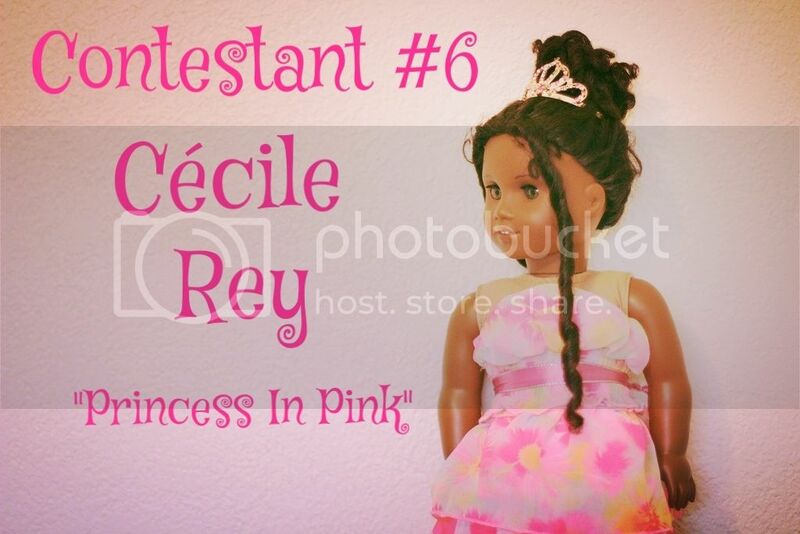 She has a large, pale pink sash. Her dress also is tiered with three layers. She has aqua-blue sandals that match the blue butterflies in her dress. And now, to recap it all and give you a chance to vote! And now, YOU will get to pick the winner! Who will be the winner of this month’s Fashion Wars? What a neat idea, Madi! All the dresses were beautiful, but I LOVED #2! It’s so beautiful! I love Josefina’s dress! 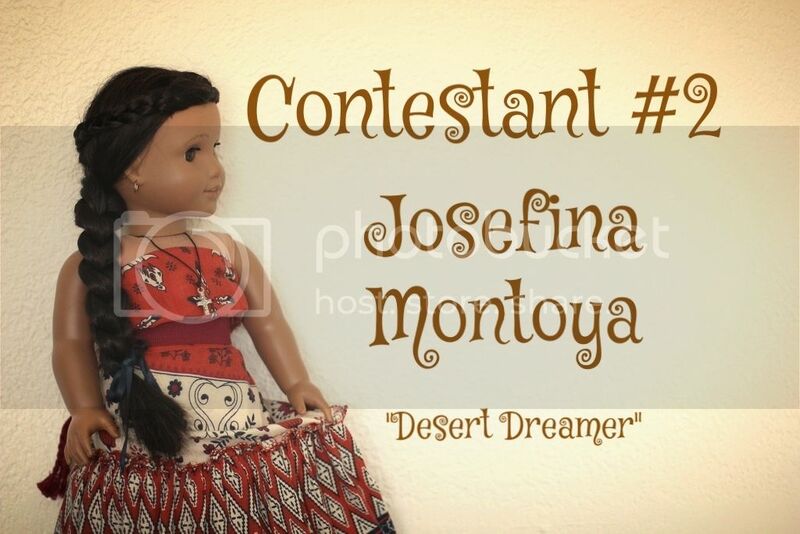 Is it OK if I post on my blog “Madison is doing a thing called fashion wars and I’m voting for Josefina!”. I also like Emelie’s dress and Molly’s dress! The trip was AWESOME! We went to the Pittsburgh marathon, and I ran a 5K there (I might not have told you this before, but I’m a runner). We also visited with some relatives in Pittsburgh. And then, we drove to Delaware, and on the way, we stopped in Lancaster (still in PA) and we went to a market, and guess what they had there? DOLL CLOTHES!!!! I bought a purple kimono dress, blue silk pajamas (they kind of remind me of Rebecca’s pre-BeforNever PJ’s), and zebra print roller skates! And THEN, there’s this company called Mainly Marathons, and they do race series, usually five days, and they do them in different states (i.e. Delaware, Maryland, Pennsylvania, New Jersey, and New York.) We run the water stop. I decided to run a half marathon (13.1 miles). Except I’ve never run one before. ?. But I said; So what? AND I DID IT!!!!!!!!!!!!!!!!!!!!!!!!!!!!!!!!!!!!!!!!!! And then, I got talked into running another one so that I could become a Half Fanatic (to qualify, you have to run two half marathons within 13 days). And guess what. When we were driving back home, we stopped at the Crayola museum, Hershey’s Chocolate World in Hershey, PA, the FDR presidential library and museum, Woodrow Wilson’s library and museum, and Monticello, Thomas Jefferson’s house. 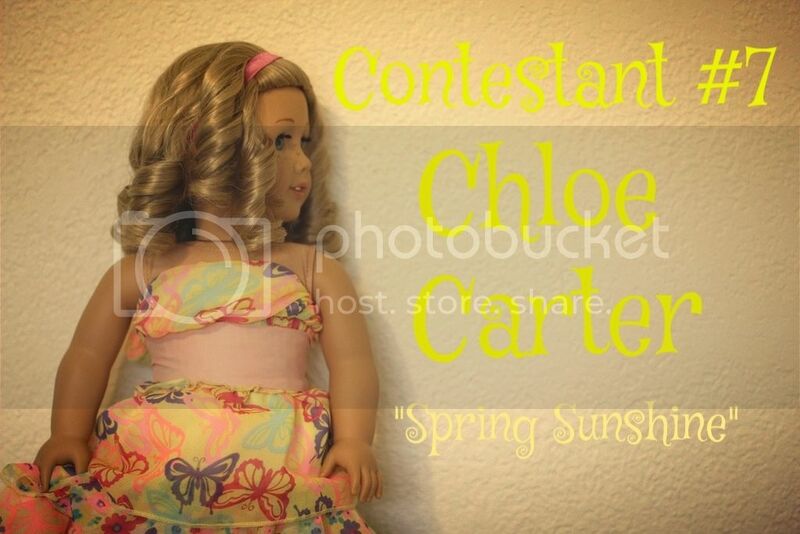 And by the way, I voted for Chloe’s outfit. ? Oops, no, not on purpose. I usually don’t proofread comments closely. 😛 Though where did you see the second typo? I only found one. I’m so glad your back! ? You did?! Awsome!! What’s the link? And: were did you see the second typo? ? I was having technical issues with my blog, but they are solved now, and the link is in the website box! Okay! I’ll ask my dad soon if I can visit it. I can’t wait to see it! Is it a doll blog or a “random” blog? OK! I’ll definitely ask my dad if I can visit it. we voted me and my grandma . Today is their last day in florida WAaaaaaaaaaaaaaa!!!!!!! They all look absolutely GORGEOUS, but I have to say I LOVE Josephina’s outfit the best! I also really liked Jasmine’s glamorous dress. I can’t wait to see more posts like these! Aw, thanks so much! Yeah, these were fun to make. June’s category will definitely be summer-themed!